[PDF] Crossing the Chasm: Marketing and Selling High-Tech Products to Mainstream Customers | Free eBooks Download - EBOOKEE! Description: Here is the bestselling guide that created a new game plan for marketing in high-tech industries. 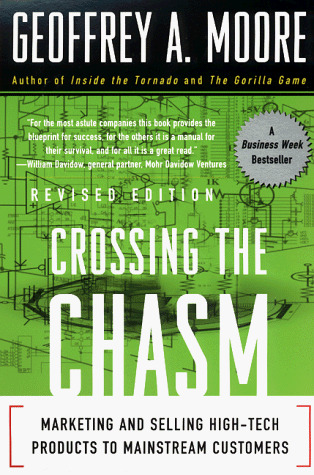 Crossing the Chasm has become the bible for brining cutting-edge products to progressively larger markets. This revised and updated edition provides new insights into the realities of high-tech marketing, with special emphasis on the Internet. It's essential reading for anyone with a stake in the world's most exciting marketplace. 2018-02-02[PDF] Booked: The digital marketing and social media appointment setting system for anyone looking for a steady stream of leads, appointments, and new clients. No comments for "[PDF] Crossing the Chasm: Marketing and Selling High-Tech Products to Mainstream Customers".